Time for something a little different! On day 55 of #AYearOfBuses, we’re taking a look at the annual heritage running day held by Ensignbus. Self-styled omnibus suppliers to the world, Ensignbus of Purfleet, Essex hold their annual heritage bus running day each December. Formed in 1972, Ensign hit the big time initially as a second-hand bus dealer, responsible for shifting 2,000 of London Transport’s DMS fleet in the 1970s and 1980s. They later moved into tendered London Regional Transport (LRT) work, before setting up their own commercial operations alongside their vehicle sales business. 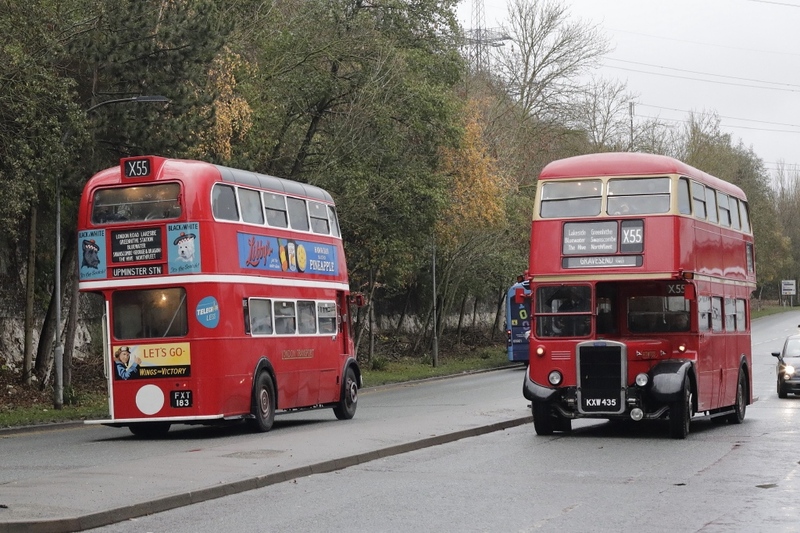 The X55 is one of three special routes run by Ensign’s collection of preserved and heritage vehicles on their running day, running every 30 mins between Upminster Station, Lakeside, Bluewater, Nortfleet and Gravesend. It features a fabulous mix of buses from yesteryear, including London Routemasters, RTs, and more. Thanks to Mark Lyons for today’s fantastic photo.